> Aha, so your using personal bias against an architecture? No, I just find it funny when a company cannot consistently describe the basic parameters of their own product. They are all part of the same system, fyi. 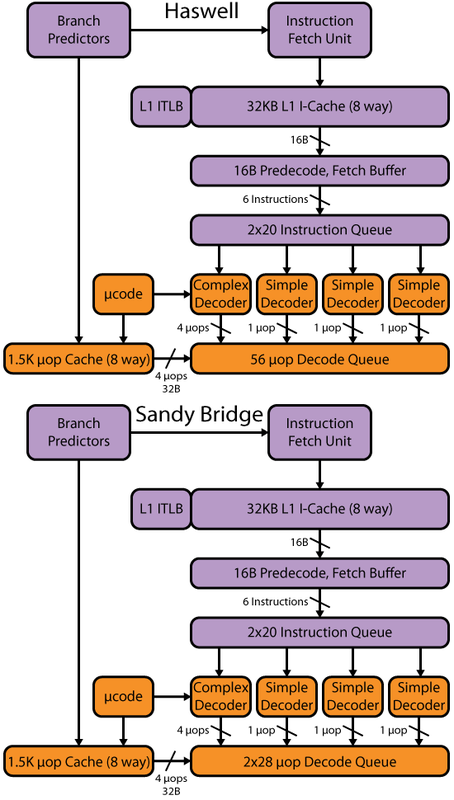 > about SIMD units and FPUs. And the 250 doesn't matter when it is bottle-necked to <= 16. Then again, it isn't like that 250 is even used when you struggle to get 50% efficiency when running linpack. aaron spink (aaronspink.delete@this.notearthlink.net) on July 28, 2012 6:54 am wrote: > jp (jipe4153.delete@this.gmail.com) on July 28, 2012 2:00 am wrote: > > Aha, so your using personal bias against an architecture? > > > No, I just find it funny when a company cannot consistently > describe the basic parameters of their own product. > > > And your > > mixing different system hardware components and want to enforce the same naming > > convention. > > > They are all part of the same system, fyi. > > > Btw I would be careful using the term "cores" and instead talk > > about SIMD units and FPUs. > > > No, cores is correct. > > > > Global node bandwidth is cute, but a majority of > > applications benefit from a high localized bandwidth. 51.2 is a small fraction > > of 250+ . > > > And the 250 doesn't matter when it is bottle-necked to <= 16. Then again, it isn't like > that 250 is even used when you struggle to get 50% efficiency when running linpack.